VGA and DVI connectors are used to transmit video from a source (like a computer) to a display device (like a monitor, TV or projector). The main difference between VGA and DVI is in picture quality and the way the video signals travel. Cleaner, faster, more precise display with hardware that supports DVI. Picture quality degrades from digital to analog conversion and back, and due to the analog signal being susceptible to noise. The maximum resolution claimed for a VGA connector is 2053 x 1536. Can convert to other standards like HDMI and VGAs. VGA to DVI and VGA to HDMI converters available. None. Requires separate audio cable. None. Requires separate audio cable. DVI offers a higher quality signal compared to VGA. The difference is especially noticeable at higher resolutions. The video quality is a factor of the mechanism of operation and the length and quality of the cable; both are discussed below. From a user's point of view, both connectors work in the same way: devices have female ports and the connector cables have male endpoints. The signal is transmitted from the source device via the port to the connector cable and the destination, which is a display device. VGA connectors transmit analog signals. The digital video signal received from the source is converted to analog to be transmitted via the cable. If the display device is an old CRT (Cathode Ray Tube) monitor, it accepts an analog signal. However, most display devices are now digital; so they convert the VGA connector's analog signal back to digital. This conversion from digital to analog and back results in a degradation of video quality for VGA connectors. Video signals transmitted over DVI need no such conversion because they are digital-only. Consequently, picture quality is better. The difference may not be noticeable for text or even SD (standard definition) video but can be seen for HD videos and hi-resolution images or on hi-res displays. For both VGA and DVI connectors, signal quality is impacted by the quality and length of cables. A cable carrying a signal is impacted by crosstalk which occurs when the signals in one wire induce unwanted currents in adjacent wires. VGA cables are more susceptible to electrical disturbances and noise compared to DVI. Always use high quality cables that provide good, thick insulation. Signal degradation is worse for longer cables; again, VGA cables are more susceptible to this problem. DVI cable lengths up to 15 ft work for displays at resolutions of 1,920 × 1,200. Cable lengths up to 50 ft can be used with displays at resolutions up to 1,280 × 1,024. For longer distances, the use of a DVI booster is required to mitigate signal degradation. The VGA connector is also called RGB connector, D-sub 15, mini sub D15, mini D15, DB-15, HDB-15, HD-15 or HD15. It has 15 pins. There is only one type of VGA connector and it is blue in color. 1. DVI-D is the digital format connector. It comes in both single-link and dual-link formats, the difference being that the dual-link connector provides more power and twice the data transmission rate compared to the single-link connector. 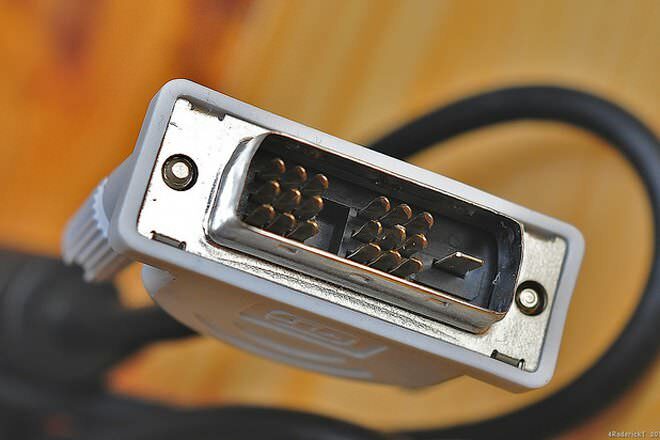 DVI-D is the most popular type of connector for hooking up DVI cards to LCD monitors. For large screens, the dual-link connector is often a better choice than the single-link connector. 2. DVI-A is the analog format connector. 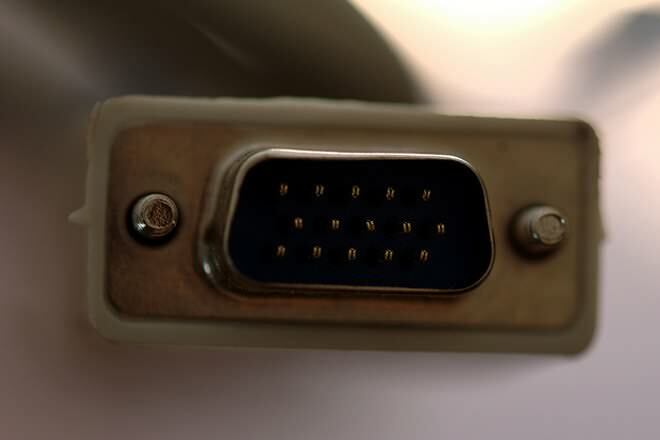 This is the type used to connect a DVI card to a CRT monitor (an analog display device). Although the signal does undergo a digital-to-analog conversion, the result is of higher quality than when using a standard VGA cable. 3. DVI-I is the integrated format connector. It works with digital and analog equipment, acting as a DVI-D or DVI-A cable, but it won't convert pure DVI-D output to analog. 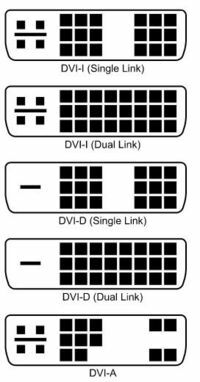 DVI-I has two variations—single-link and dual-link—and has a 29-pin layout to accommodate multiple connections. People are often constrained by the ports available on their computers. Older PCs may only have a VGA port and new monitors may only have a DVI port. In such cases you may need a VGA to DVI adapter to connect this PC and monitor. It should be noted that you cannot get DVI quality by using a VGA to DVI adapter. While some quality issues like signal degradation in longer VGA cables can be avoided by using an adapter near the video source, the digital-to-analog conversion necessitated by the VGA port does degrade signal quality. There is a lot of misinformation in this article. There is no better way to convey a pure RGB video signal than a pure RGB high-quality analog link. This is what all other technologies are compared to. The DVI standard falls down in lots of ways. It is very confusing and sometimes impossible to tell which kind of DVI you have. There is no way of telling for sure. Contrary to what is said here, there is no difference between the DVI-A link and VGA. It is the same thing with a different pinout. The only place where DVI comes out on top is when you get to higher resolutions, beyond 1080p. The analog link has to be carefully implemented to preserve the fine detail. But since the pixel clock rate is so high, the DVI link is subject to restrictions as well, such as on cable length. Signal dropouts due to cable capacitance cause artiffacts in the display which appear as a sort of sparkling effect which is at least as bad as the degradation in sharpness of a VGA analog link.